The dark quirkiness of this film might come through better on the small screen, actually. This is a movie you can use to keep you company while doing Saturday chores. But I'd still wait for cable. On a cutting room floor somewhere lie 15 to 20 minutes of footage that might have made the metaphorical monster movie "No Such Thing" a trenchant, ironic cultural satire instead of a frustrating misfire. It's a caustic, deadpan, beauty-and-the-beast comedy that takes wide swipes at Western civilization's social ills and the "if it bleeds, it leads" mentality of media-induced modern cynicism -- and does it well up to a point. But just as the story hits its stride, writer-director Hal Hartley ("Flirt," "Henry Fool") fast-forwards through what should be the film's heart. Innocently intellectual Sarah Polley ("Go," "eXistenZ") stars as Beatrice, a guileless gopher for a cold-hearted TV news producer (a whimsically savage Helen Mirren) who begs and pleads for her big chance to become a reporter by following up on the disappearance of a network news crew in Iceland that included her cameraman fiancé. 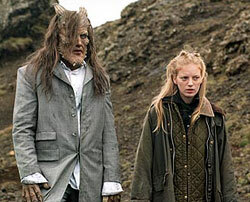 Granted her wish, she goes through several tribulations (including a tangential airplane crash that leaves her hospitalized for six months) before becoming a post-modern Little Red Riding Hood who finds herself face-to-face with a misanthropic monster-man (Robert John Burke, "Thinner") on a remote and rocky Icelandic coastline. He's an immortal, fire-breathing grouch with multiple mismatched horns on his head, gangly hair that flops in his eyes and an unwashed, mix-and-match wardrobe that spans centuries of discarded fashions. He's hated humanity literally forever -- "I remember when you were young," he huffs. "Pond scum. Just ooze on the edge of the warm water." He nonchalantly owns up to killing the news crew -- he's killed thousands over the millennia, so what? But he doesn't know what to make of Beatrice because she's not scared of him. In fact, she likes him. She likes him so much he hopes she might help him die, which has been his only wish for thousands of years. Burke's performance as the acrimonious monster is a masterpiece of callous, derisive comedy. As a symbol of centuries of human nature run amuck, he seethes with amusing misanthropy and malice toward mankind that only escalates when naive Beatrice becomes a victim of her own sensationalistic network and ends up bringing the beast to New York, where her boss plans to exploit him "as long as he's fashionable." But when they hit Manhattan, Hartley abandons the quintessence of his story. Just when the monster should be tested by his promise to Beatrice to not kill anyone in the most aggravating city in the word; just when Beatrice should be struggling with her fleeting newfound celebrity; just when the metaphors really start to mean something, the director takes a shorthand approach to all these themes, reducing them to less than 10 minutes of montage footage completely bereft of the depth that was clearly intended. Why this happens, only Hartley could say. On a small picture such as this it's not as if some baffled studio suit took the film away from him and had it chopped up for mass consumption. But the effect is the same -- the movie is ruined. It's obvious that there was more to the Manhattan episodes than made it to the screen and the minced remains leave several loose ends to boot. Regardless of the reason for these severe cuts, the soul of "No Such Thing" went with them, and it's a pity because up to that point, the picture was a clever dark delight.